« Is there a “value” bubble in Australia? Whilst there has been so much talk about how funds are flowing out of bonds into equities there is little sign of it in the markets. The above chart shows Australian Government yields near the low levels of last June when the Eurozone was looking like blowing up creating a potential catastrophic scenario. 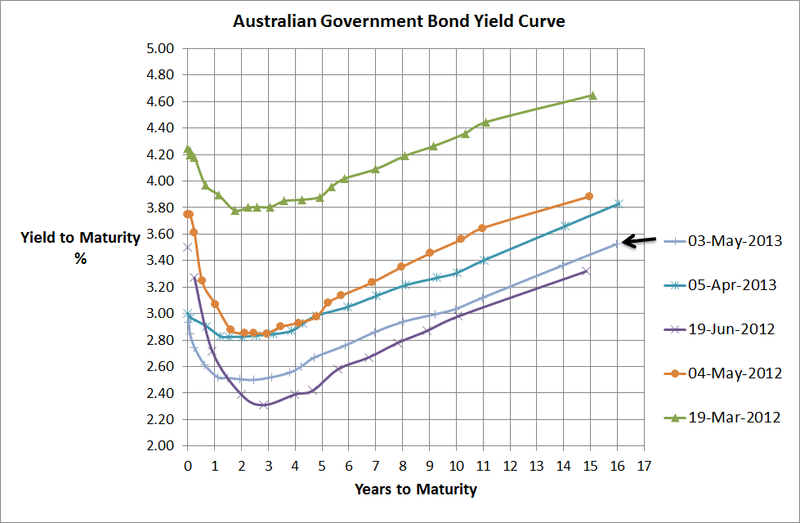 With a 16 year Australian government bond paying a yield of only 3.5%, it drives me nuts when I hear all of the BS about Australian government debt. I don’t know about you, but if I could borrow at 3.5%pa with the ability to print my own money, I would hardly be concerned about having to borrow money to fund infrastructure spending that can only help the future income prospects of the nation. Both sides of government have painted themselves into a ridiculous political corner on the debt issue and whilst economic growth is certainly an issue thanks to the end of the resources boom, there is nothing with spending some funds wisely to create an economic future of further prosperity. Anyway, I digress. From an investment strategy perspective, the money printing central banks of the world are ensring that all asset classes are well supported. The risky asset and bond buckets are all fairly full and look out when the US and to a lesser degree Japan switch off the printing press. Until then, its difficult to see anything but continued risk asset growth with stable bond yields.